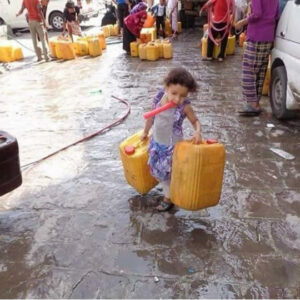 World BEYOND War News: Close All Bases - World Beyond War . . .
World BEYOND War and allies met in Dublin, Ireland, this past weekend. Text and video of David Swanson’s remarks are here. 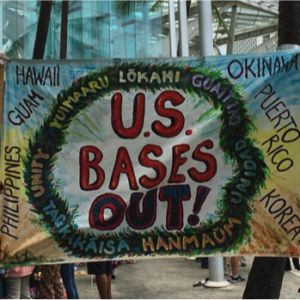 Pat Elder presented here on the subject of the environmental damage of bases. Three complete videos of the three days of the conference are here. The conference program and schedule are here. 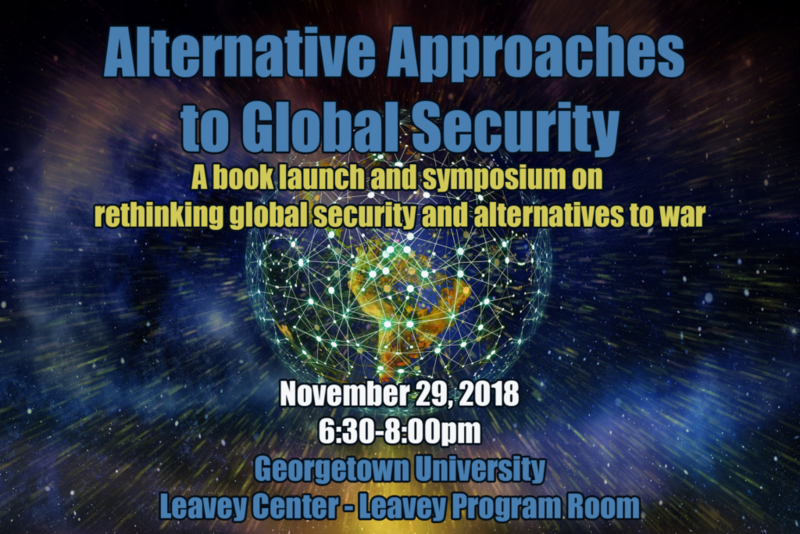 Alternative Approaches to Global Security: A book launch and symposium on rethinking global security and alternatives to war. Thursday, November 29, 2018, 6:30 – 8:00 pm ET. Georgetown University Leavey Center, Leavey Program Room. 3800 Reservoir Road, NW, Washington, D.C. 20007. Free and open to the public. Learn more and RSVP. War Abolition 101 is a six-week online course providing participants an opportunity to learn from, dialogue with, and strategize for change with World BEYOND War experts, peer activists, and changemakers from around the world. Learn more and reserve your spot, or enroll a friend as a gift! Here’s a new PDF booklet about what World BEYOND War is working on. We need your support. When you buy anything as a gift or make a donation on someone’s behalf, we’ll send a beautiful card at the time of your choosing to inform the recipient of your gift to them. 1. Sign yourself or a friend or loved one up for our online course War Abolition 101. 2. 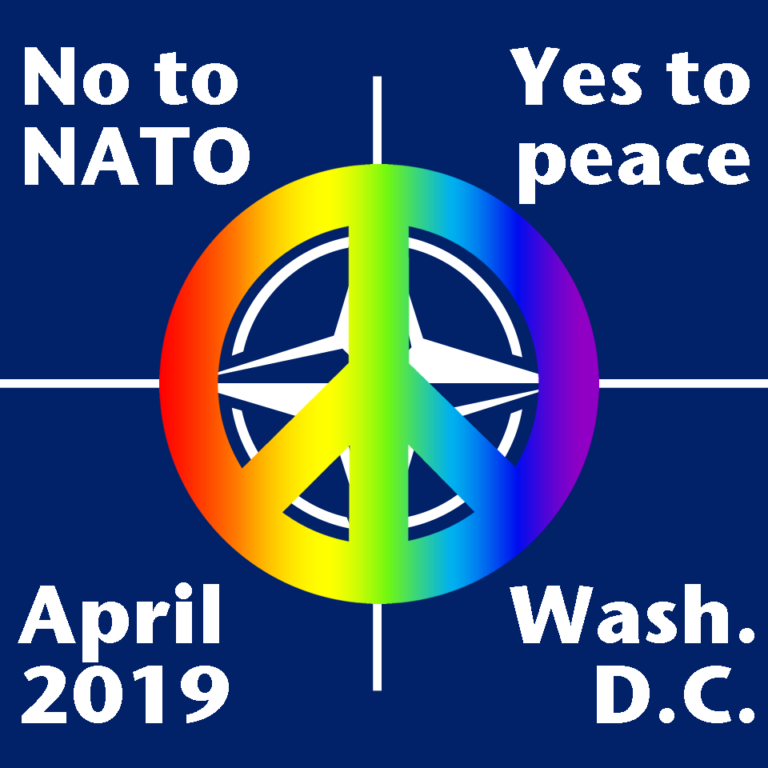 List yourself or someone else as a sponsor of No to NATO — Yes to Peace. 3. Purchase the 2018-2019 edition of our book A Global Security System: An Alternative to War. 4. Buy (for yourself or as gifts) a sky blue scarf, or any of our wonderful t-shirts, hats, mugs, maps, flags, puzzles, stickers, pajamas, etc. 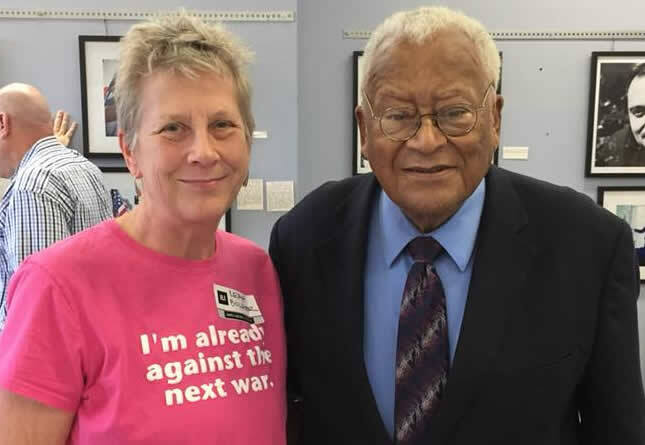 Take a photo of yourself in a World BEYOND War shirt and share it on social media with the hashtag #worldbeyondwar and we’ll share it too and possibly include it in a future email. At right are Leah Bolger and James Lawson. 5. Make a tax-deductible donation to our billboards fund so that we can put up more billboards like these. 6. Make a tax-deductible donation — consider making it as a gift for a friend — to World BEYOND War. 7. Become a recurring donor and receive a scarf, t-shirt, or any of a great selection of books as our thanks. Thank you to all of you who already support creating a world beyond war in all of the ways above! If you can do more, we’ll be able to do more! God has answered my prayer and that of many others. Its check mate time..